We live in one of the most exciting times in history. The amount of technological innovation that has happened over the past few years is remarkable. For anyone looking to start their own business, the barriers to entry have never been lower. Existing organizations are more empowered than ever before to offer their services to a broad audience. At the core of this innovation is open source software. I’ve been fortunate to be involved in the open source world for many years. Open source has accomplished a great deal, but the best is definitely yet to come. Today I’m excited to announce the NGINX Application Platform. A suite of four products, built on open source technology, that together, I believe, will help organizations offer more to a broader, truly global audience. Combined, these four tools are at the core of what organizations need to create applications with performance, reliability, security, and scale. The NGINX Application Platform begins with NGINX Plus, which you’re already familiar with. It’s the commercial variant of our popular open source NGINX software. NGINX Plus is a combined web server, content cache, and load balancer. You use NGINX Plus at the edge of your application to provide these services and act as a shield for the applications behind it. The second product is the NGINX Web Application Firewall (WAF), which we released earlier this year. Built on the widely deployed open source security software, ModSecurity, the NGINX WAF provides protections against Layer 7 attacks (such as SQL injection), scanners, bots, and other bad actors. The NGINX WAF is a dynamic module that plugs into NGINX Plus. The third piece of the NGINX Application Platform meets a long‑standing need for the NGINX community. Many of our users call NGINX a “Swiss Army® knife” because it can do so much. No other software, commercial or open source, can do what NGINX does. Looking at the functionality of NGINX, though, there is one missing piece: it can’t run your application code directly. With NGINX Unit, we’re filling in that missing piece. NGINX Unit is a new application server designed by Igor Sysoev and implemented by the core NGINX software development team. Just like NGINX, Unit is open source. 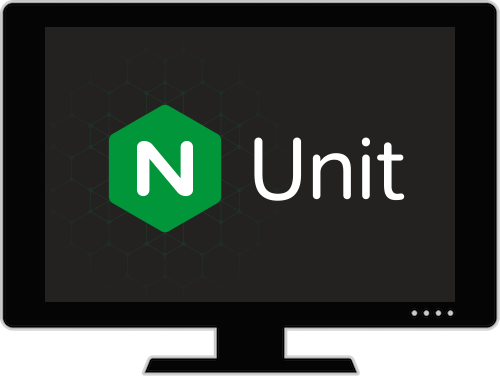 And Unit goes through the same rigorous development and testing practices as NGINX – so you’ll be able to deploy it with confidence. What makes Unit unique is that it’s completely dynamic. You can switch to a new application version seamlessly, without restarting any processes. You can even have blue/green deployments within Unit and switch between them with no service disruption. All updates in Unit are graceful, with no restarting. And, all Unit configuration is handled through a built-in REST API using JSON configuration syntax; there’s no configuration file. Unit supports multiple languages. At launch, Unit will run code written in recent versions of PHP, Python, and Go. You can use Unit to run your WordPress sites. With Unit, you can run applications written in all these languages and language versions on the same server. We’ll be adding support for more languages, with Java and Node.JS support coming soon. We encourage you to give Unit a try or read more about it and let us know what you think. For as long as I’ve been at NGINX, we’ve envisioned creating a product that enables a single point of control for deploying, managing, and monitoring NGINX. That would take away the burden of managing the day‑to‑day of an application so you never get the pager call in the middle of night. Today I’m pleased to announce that product to you, the fourth and final piece of the NGINX Application Platform: NGINX Controller. 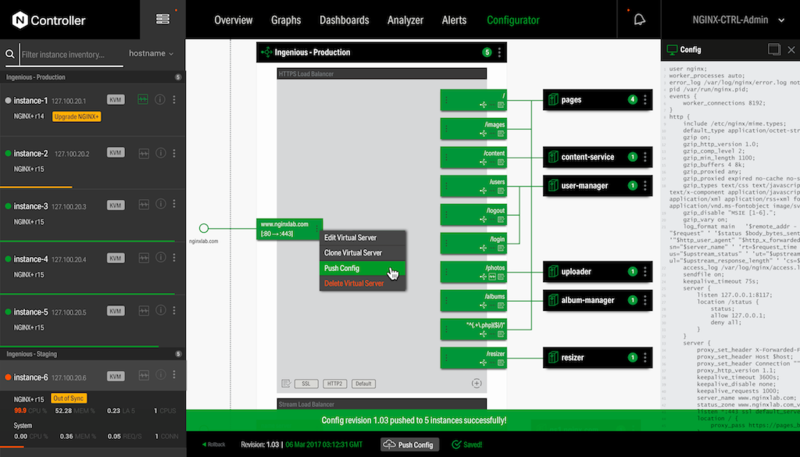 NGINX Controller is a centralized monitoring and management platform for NGINX Plus. 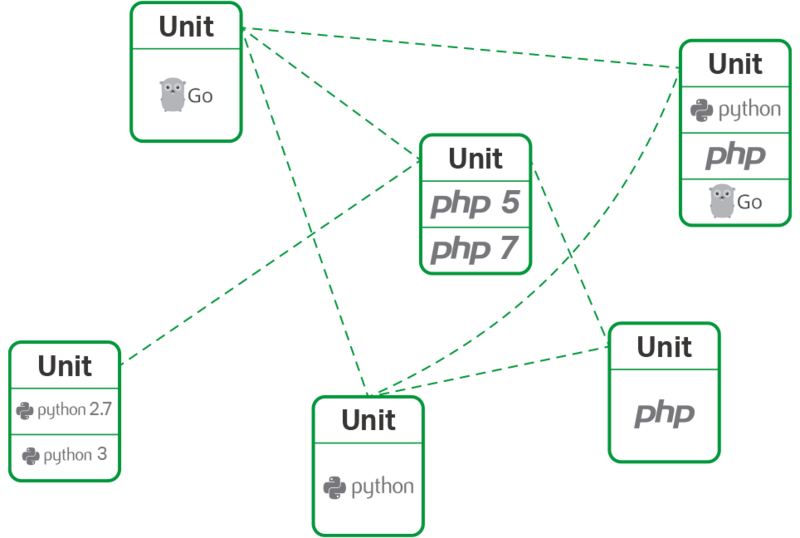 With Controller, you can manage hundreds of NGINX Plus servers from a single location. Using an intuitive graphical user interface you can create new instances of NGINX Plus and centrally configure features like load balancing, URL routing, and SSL termination. Controller has rich monitoring capabilities to help you monitor application health and performance. NGINX Controller is easy – even fun – to use. 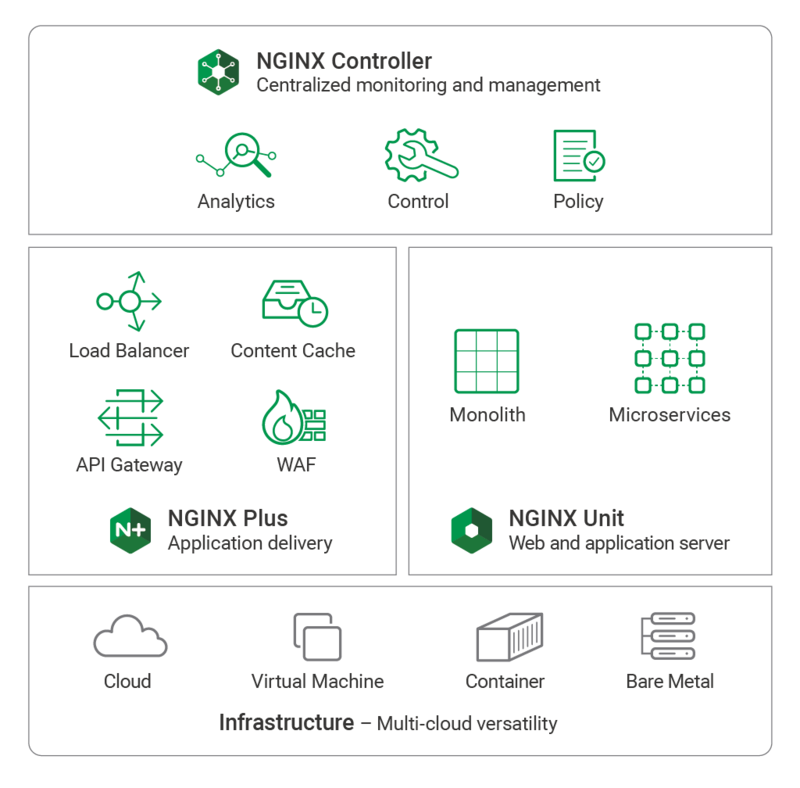 NGINX Controller helps enterprises move beyond the manual processes that stifle innovation. With NGINX Controller, IT provisions virtual load balancers for application teams, and then allows them to manage the load balancers themselves. This self‑service capability enables application teams to adopt agile development practice, while freeing IT to focus on maintaining a stable infrastructure, without disruptions. We have a strong vision and roadmap for NGINX Controller. Right now, NGINX Controller manages only NGINX Plus, but we’re working to expand that support to include NGINX WAF and NGINX Unit. NGINX Controller will be released as a private beta in Q4 2017, with full general availability scheduled for early next year. If you’d like to get on the list for the private beta, please sign up here. Imagine a platform that’s based on one of the most important, and most widely respected, open source projects in the world. A platform that helps you develop and deliver fully modern apps – and that helps you extend existing application code strongly into the future. A platform that’s powerful, flexible, and extensible. And that makes application delivery easier, more effective, and even fun. The NGINX Application Platform gives enterprise a modern toolset for delivering complex applications. It is a suite of four products – NGINX Plus, NGINX WAF, NGINX Unit, and NGINX Controller – that together give enterprises the tools they need to build scalable and reliable applications.